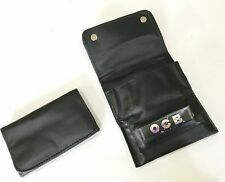 Black Tobacco Pouch Faux Leather Fully Lined Rolling Paper Slot COMPACT STYLE. Interior Contains a Booklet Holder and tobacco Section 11cm X 11cm. Front Flap Has Magnetic Button Closure. Black PU Leather. RAW logo across the front and the back. Protects your papers from getting crushed. We do not accept any liability if your order is delayed by our carriers or due to adverse weather. All our International orders are sent. This is aluxury quality product. Perfect for the smoking connoisseur. 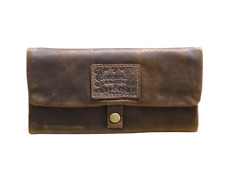 This is a classic tobacco pouch ideal for the smoker on the go. It is small enough to put in the back pocket, but opens up into a box shape when opened making it easy to get your hands into. It is soft dark brown real leather with skin lining inside to keep your tobacco fresh. If you like rolling your own smokes, you'll know the importance of a quality pouch. 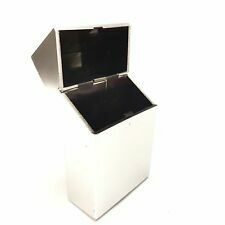 Essential for keeping your tobacco at its freshest, this is a piece of kit that you simply cannot do without. Thick Soft Skin Lined to keep tobacco Fresh. Lift the front flap to reveal a tasteful beige lining, designed to keep your tobacco from drying out. Close the flap and push the poppers fasten securely, giving you peace of mind knowing that your tobacco is secure. Interior Contains a Booklet Holder and tobacco Section 12cm X 13cm. Zippered Pocket on Back. Black PU Leather. This is a soft PU leather tobacco pouch. You may require providing with signature to confirm that you and none of the residence of your house have not received the item. 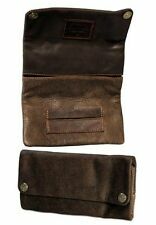 This is a PU soft leather tobacco pouch. Best piece for your smoking accessory. Easy to carry case/pouch made from soft PU Leather. SIMPLY SQUEEZE THE CONTAINER TO OPEN. SILICONE CIGARETTE CASE. FITS 20 X STANDARD LENGTH CIGARETTES. SIMPLY SQUEEZE THE CONTAINER TO OPEN. FITS 20 X STANDARD LENGTH CIGARETTES. PERFECT ITEM FOR CARRYING CIGARETTES AND KEEPING THEM FROM BEING CRUSHED. The Pouch Is Closed Securely With 1 Button Clip. Has A Paper Slot. The Pouch Is Closed Securely With 1 Button Clip. The tobacco pouch made of leatherette is easy to clean and especially suitable for vegans. Material: Leatherette, smooth. 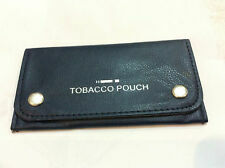 Tobacco Case Pouch Black. Internal Case for tobacco papers. With two strong magnets for easy closing, even when the pouch is full. External zip pocket. The tobacco pouch made of leatherette is easy to clean and especially suitable for vegans. Material: genuine Leather. The thoughtful design allows easily to stow tobacco, cigarette papers, filters, grinder, lighter and a rolling tray. Genuine calf leather is a premium quality leather, very smooth and owns fine grains, which gives the product an extremly soft and supple character. Tobacco Case with Crazy Cat. Case for tobacco papers. With two strong magnets for easy closing, even when the pouch is full. External zip pocket. The thoughtful design allows easily to stow tobacco, cigarette papers, filters, grinder, lighter and a rolling tray. Genuine cow leather is a premium quality leather, very smooth and robust, which gives the product an extremly soft and supple character. Case for tobacco papers. With two strong magnets for easy closing, even when the pouch is full. External zip pocket. Tobacco Case with " Sons of Anarchy ". Case for tobacco papers. With two strong magnets for easy closing, even when the pouch is full. External zip pocket. Tobacco Case Pouch Pink (also pink the back side of pouch). Internal Case for tobacco papers. With two strong magnets for easy closing, even when the pouch is full. External zip pocket. Tobacco Case with "Joker". Case for tobacco papers. With two strong magnets for easy closing, even when the pouch is full. External zip pocket. Tobacco Case with "Hot Girls". Case for tobacco papers. With two strong magnets for easy closing, even when the pouch is full. External zip pocket. Tobacco Case with "Snake Skin". Case for tobacco papers. With two strong magnets for easy closing, even when the pouch is full. External zip pocket. Tobacco Case with "Daltons". Case for tobacco papers. With two strong magnets for easy closing, even when the pouch is full. External zip pocket. Hand roller to turn your cigarette easily and quickly! With fabric for better twist of the cigarette! Tobacco Case with "Anchor Lady". Case for tobacco papers. With two strong magnets for easy closing, even when the pouch is full. External zip pocket. Tobacco Case Pouch Black with "Love Natural Tribal". Case for tobacco papers. With two strong magnets for easy closing, even when the pouch is full. External zip pocket. High quality leatherette, durable for frequent use. Tobacco Case with "Skull". Case for tobacco papers. With two strong magnets for easy closing, even when the pouch is full. External zip pocket. Tobacco Case with "Led Zeppelin". Case for tobacco papers. With two strong magnets for easy closing, even when the pouch is full. External zip pocket. Tobacco Case Pouch Black with Aerosmith Design. Case for tobacco papers. Closed (empty): Length: 14 cm, Width: 8cm, Height: 3 cm. With two strong magnets for easy closing, even when the pouch is full. The Handcrafted Rolling Tobacco Case Cigar Pouch Paper Smoke Handmade Green Key Ring is a handmade case for your tobacco. It closes with a silver key ring. Suit able for a woman or a man, great present. 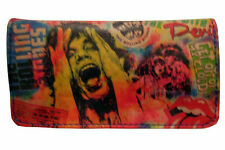 Tobacco Case Pouch Black with Bob Marley Singing. Case for tobacco papers. With two strong magnets for easy closing, even when the pouch is full. External zip pocket. High quality leatherette, durable for frequent use.